On a brisk afternoon last November, I drove to the post office to mail a package. Walking back to my car, I spied a sycamore leaf on the sidewalk. Scooping it up, I examined its interesting form and delicate coloration. The leaf was something most passersby would likely overlook. To me, it was a botanical specimen, its unique shape rendered all the more interesting in juxtaposition to the angular stretch of sidewalk on which it rested. I ferried my little treasure home, traced its outline on paper, cut out the shape, and added it to my growing collection of leaf templates. Because I wanted to preserve late autumn loveliness, I decided to design hand-beaded leaf ornaments as Christmas gifts for our children. Happy with the concept, I wandered around our property, plucking leaf-jewels from the grass, considering which kind of leaf would make the most fitting gift for each child. A stalwart symbol of fortitude, a white oak leaf was my immediate choice for our youngest daughter, who moved far from home last August. The white oak is not only the state tree of Illinois, it’s also a reminder of our home, which nestles on a hillside heavily populated with oaks of various kind. A red serviceberry leaf was my choice for our son and his wife. Like the white oak, the serviceberry is native to Illinois. When our future daughter-in-law first visited us in April of 2011, she and our son posed for a photo beneath the white-blossomed boughs of our serviceberry, an airy tree that forms a lacy canopy over our garden arbor bench. I selected a yellow river birch leaf for our oldest daughter. While the river birch isn’t native to Illinois, it’s certainly a familiar icon of home. When our family moved to this house, we planted a river birch that has become the focal point of our front yard. Also, although many miles and state lines divide us, we and our oldest daughter both live beside the Mississippi. Because a deep flowing river connects her to us, a river birch leaf seemed just the right choice. Before Christmas dinner, my loved ones clasped hands beside the sparkling tree. All heads bowed to hear once again the familiar words of my mother’s lovely Christmas benediction. I read the words aloud for the first time without tears… Ours was a sweet, simple, natural, joyful, meaningful Christmas. I’ll cherish its memory always. All too quickly, the holidays have come and gone. Our beloved children are back once again in their respective cities. As I write, freezing rain taps at the window. Glancing up, I notice our metal peace dove. She hangs from a prominent bough in our Japanese maple. With a coating of ice on her wings, the dove teeters precariously, just as peace seems to teeter in this uncertain world. Braving the icy onslaught, our peace dove maintains a resolute southward gaze, as if focusing her vision on warmth, kindness, light, growth, renewal. In her beak she holds something precious: a leaf! It makes me smile… Her wings are spread wide, inviting me to rise with her above the heaviness of the fabricated world and soar free in the true one. My true world is the real world: the world of nature –a place of repose and inexhaustible beauty where all are welcomed home. Postscript: For those of you who enjoy reading my occasional musings, I apologize for posting them so infrequently. Since 2015, I’ve been studying embroidery, which has equipped me with a fascinating new means of expressing myself. I’m happy as can be with my needle in hand, but embroidering more has meant that I’m writing here less. I still have things to say, however, so stay tuned! If you’d care to connect with me on Instagram, I maintain a regular presence there. My account carries the same name as this blog: mypathwithstarsbestrewn . Prairie Lights, my favorite independent bookstore in Iowa City, recently informed me that this week, May 1 – 7, is Children’s Book Week. The words, “children’s books” contain the exact number of syllables as the words, “treasure trove”, and to me, these word pairs are synonymous and interchangeable. What marvelous magic a children’s book wields! I keep a running tally of many favorite things, but I’m quite certain children’s books rank among my topmost five. I can’t let Children’s Book Week slip by without mentioning a book I adored as a child, a book whose wisdom set me on a path that shaped me into the person I am today. When I was small, not only was I certain the book I mention was written just for me, I felt I was its main character – a lonely little girl who lived by a pond and wandered through nature in search of someone, anyone, to play with. I was that child, right down to the light cotton dress and white anklets. Allow me to introduce to you this beloved book: Play with Me, by Marie Hall Ets, The Viking Press, 1955. In Play with Me, text and illustration weave a beguiling tale. A little girl goes off to the meadow in search of a friend. One after another, she asks the creatures she meets, “Will you play with me?” But each one leaps or flies or bounds or slithers away, and she’s left alone to console herself by sitting quietly on a stone to watch bugs making trails in the pond. She is too preoccupied to notice the tender presence of a benevolent sun. As she sits without moving, her sadness turns to joy as one by one, the meadow creatures quietly return. She realizes that now, all of them are “playing” with her. By becoming observant and unobtrusive, she accumulates a rich circle of friends. When one is badly hurt, one can tend to grow quiet, shrink inward. My inner survival mode caused me to withdraw deep into my own roots to wait, to hope, to dream. Just after Christmas of 2015, I decided that since I had to sit day after day in a chair to elevate a throbbing ankle, I might as well put my time to good use. I decided to study my mother’s embroidery books. And that’s just what I did. I spent the early months of 2016 reading about and practicing every single stitch in those books. And in the process, I discovered that all those tiny stitches had become for me a new lexicon, a language I could use to express myself. At that time, I couldn’t go to the meadow or wander by the river. I couldn’t even get out of the house without a wheelchair. But with needle and thread for a magic carpet, I was no longer chair-bound. I was free to lose myself in a world of my own imagining, a comforting place filled with beauty and peace. I’m able to get around on my own again, thanks to a pair of custom orthotics, a pair of sturdy, if unfashionable, shoes, and the great good help of my wonderful physical therapists, Laura and Shari. I’m able to walk by the river or visit the woods. I can spend time in the garden. But I continue to spend hours filling hoops and fabric with the things I knew and loved best as a child: flowers and trees and meadows, birds and butterflies. Having grown accustomed to the deep solitude and isolation of an overwhelming injury, I’m less inclined to talk. I’d much rather speak with needle and thread. Whereas writing is often laborious for me, I find that embroidery is light and pleasant and marvelously meditative. When I take up my needle, I’m not only deep in my roots, I’m growing. I’m creating. I’m happy! These musings bring me back to Children’s Book Week and the charming book that set my feet on a path which led to the quiet joy of making friends with nature. To celebrate Children’s Book Week 2017, I’m going to order a copy of Play with Me and donate it to my local library. There are lonely children everywhere who long for a companion. What better companion than a wonderful book? These two photographs are a companion to my previous post (Love, our subject:). I’m including them here to chart my progress, and to encourage myself to keep working at reproducing this intricate 18th century English sampler. Completed in 1780 by eleven-year-old Sarah Brignell, the original is on display in the Victoria and Albert Museum, London. I chose to reproduce this sampler because of its imaginative floral border and because of the primitive cartouche that appears in the center of the piece. Within this little globe are a girl, a tree, a stag, a bird, a butterfly, a flower, a green meadow, blue sky, a smiling sun – a child’s version of Eden. I’ve never seen another historical sampler that looks like this one, and I find it charming. As I mentioned in my previous post, the ongoing challenge of the Sarah Brignell sampler is that the words of its hymn are worked with a single strand of black silk floss over a single thread of 35 count linen – which means there are thirty-five strands of linen to the inch. In the case of this sampler, it also means there are thirty-five cross stitches to the inch – incredibly tiny. I’ve had quite a time of trying to see what I’m doing. Although I’ve worn bifocals for several years, bifocals alone are insufficient for this task. I attempted to work with a needlework magnifier perched in my lap, but found it far too cumbersome. It’s the same reason I’ve never been able to work with an embroidery hoop – it gets in my way and feels artificial. 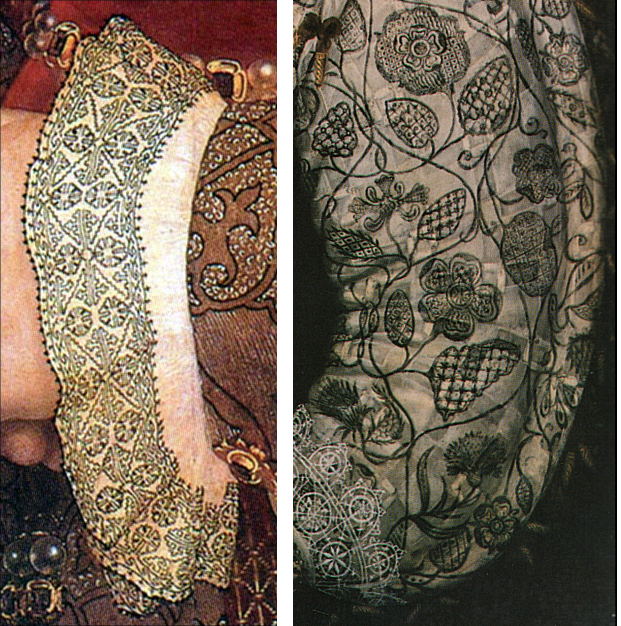 I suppose I’m a needlework purist of sorts – I want nothing between me and my embroidery. However, in the case of the infinitesimal stitches required in the Sarah Brignell, I needed help and ultimately discovered that putting a pair of reading magnifiers over the top of my bifocals worked perfectly. And that, my friends, is how I earned one of my family’s affectionate nicknames: Six Eyes. 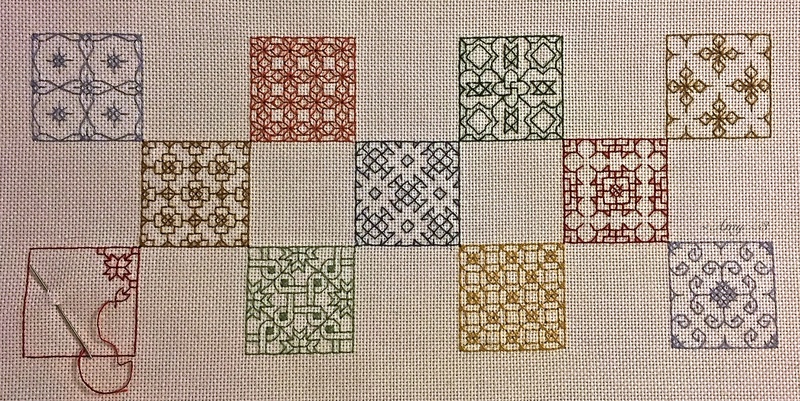 Sometime, I’ll tell more about my love of samplers and needlework in general. For now, my embroidery chair in the sunroom beckons. I think I’ll put Ola Gjeilo (my latest favorite composer) on the stereo, unite with all the unsung embroiderers of days long flown, and focus (all six of) my eyes on a work of love. 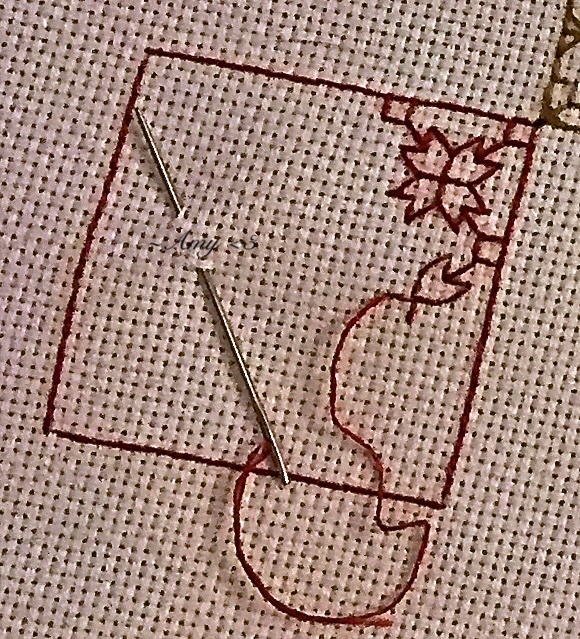 With a single strand of black silk floss, I spend the better part of an afternoon embroidering the word “l o v e” in minute cross stitches – 35 to the inch – over one thread of fine-woven, ivory linen. 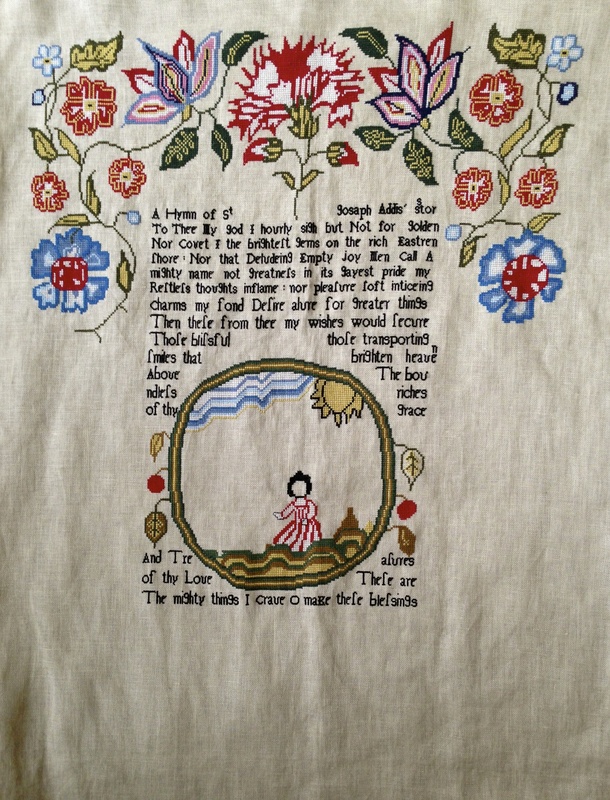 (The word is part of an exquisite 18th century English reproduction sampler I’ve been working on for several years.) As I work each microscopic stitch, taking care to keep my thread’s tension light and even, neither too taut nor too slack, I unchain my thoughts and let them wander. I think long on love. I wonder why this four-letter, one-syllable word can be so delicate and diaphanous, so difficult to execute on fabric, to effectuate in life. Love is what we wish to give, what we hunger to receive. It’s what we dedicate our lives to, this sacred, abstruse word we’ve sought to define from the dawn of collective consciousness. “Love, our subject:/we’ve trained it like ivy to our walls,” says the poet, Adrienne Rich. At last, I complete the word, secure my needle, and close my eyes, fabric in hand. I am able to extend a finger, run it lightly over the tiny topography of letters, and read the word whole, like Braille. Somewhere in my heart, a poem yearns to find release. Where are the words to give it wing? I can only ask the roving wind. What I do know, what I can simply say, is that love – prismatic, manifold, undefinable, so worthy of all we can possibly give to it – is not easily captured in black and white.